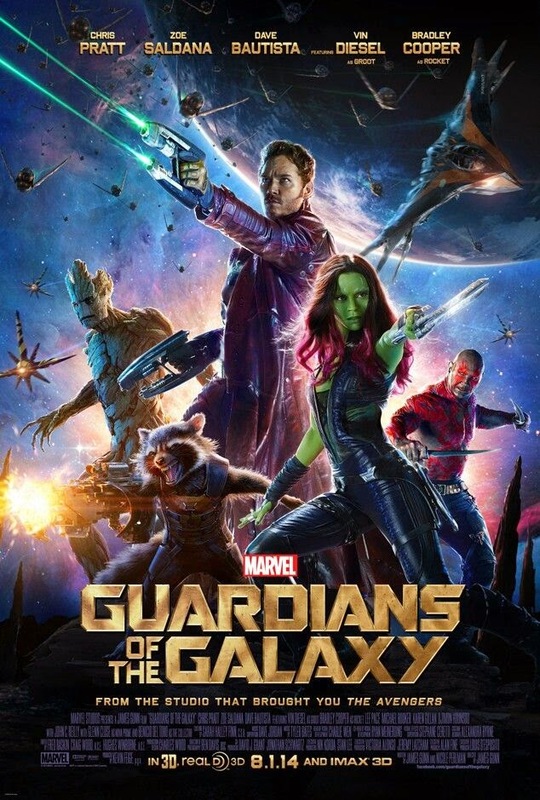 'GUARDIANS OF THE GALAXY': Five Stars (Out of Five) Sci-Fi superhero flick based on the popular Marvel Comics team, of the same name. It was directed by James Gunn and written by Gunn and first time film writer Nicole Perlman. Gunn is mostly well known for directing and or writing (or co-writing) popular indie cult classics like 'SLITHER', 'SUPER' and 'TROMEO AND JULIET'; this is his first big budget blockbuster (and it was produced with a $170 million budget). It stars Chris Pratt, Zoe Saldana, Dave Bautista, Lee Pace, Michael Rooker, Karen Gillan and the voices of Bradley Cooper and Vin Diesel. John C. Reilly, Djimon Hounsou, Glen Close, Benecio Del Toro and others also play parts in the film. The story revolves around a group of misfit outlaws who attempt to keep a powerful orb out of the hands of a monstrous villain named Ronan. It's my favorite movie so far this year. Pratt plays a thief named Peter Quill. He goes by Star-Lord and travels around space hooking up with hot young alien women and stealing valuable artifacts. He was abducted from Missouri as a child, shortly after his mother died, and raised by smugglers called Ravagers. When Quill betrays Yondu Udonta (Rooker), the leader of the Ravagers, Yondu puts a bounty on him. Quill stole a valuable orb for him but doesn't deliver it. The price on his head attracts the attention of a genetically modified raccoon, named Rocket (Cooper), and his tree-like friend, named Groot (Diesel). Quill also runs into an alien assassin, named Gamora (Saldana), who wants the orb so she can keep it out of the hands of her employers, Thanos (Josh Brolin) and Ronan (Pace). When the four outlaws are captured and imprisoned, by the Nova Corps, they decide to team up to escape. They also join forces with a warrior named Drax the Destroyer (Bautista), who wants revenge on Ronan for killing his family. I found this film to be immensely entertaining; it's the type of movie I grew up on and became fascinated by filmmaking because of. It reminds me of a classic 80's sci-fi flick, in the same league as 'STAR WARS' or 'STAR TREK', and the characters are all really enjoyable. The performances are all great (especially Cooper in my opinion) and Gunn did an amazing job directing and co-writing the script. The soundtrack is perfect and it's a beautiful movie to look at too. I laughed, I cried, I was really thrilled and entertained by it; it has a little bit of everything in my opinion. I couldn't praise the movie more; it's a near perfect film. I can't wait for the sequel! Hey good job Tim! Though, I noticed some spelling errors that I thought I should address. First, you added a 't' to Chris Pratt's name. I know he's cool, but Christ? Haha! Then, the second time you mention Yondu, you added an extra 'u' to the name. And last, this isn't a spelling error, just a person error. As Thanos, instead of listing Josh Brolin, you list his father James. Anyway, just thought I should mention those.